The Dept. of Agriculture's Food Safety and Inspection Service (FSIS) and the Dept. of Health and Human Services Food and Drug Administration (FDA) last month issued a joint proposed rule to establish a set of general principles for evaluating whether to revise, eliminate or create new standards of identity for food. FSIS and FDA share the responsibility for ensuring that food labels are truthful and not misleading. FSIS has authority to regulate the labeling for meat, poultry, and processed egg products while FDA regulates the labeling of all other foods. "Today's action starts us down the road on a set of general principles that mark a significant step toward modernizing food standards," says acting FSIS administrator Barbara Masters. "The rule will likely encourage the development of food products with better nutritional profiles and stimulate innovations in food processing technology. The rule, if adopted, will allow both agencies to better utilize resources to better protect public health." Recent technological advances in the food industry have led to increases in petitions to modify food standards. It is intended that the general principles will lead to the updating of existing standards or the creation of new standards with the goal of allowing industry to continue to produce safe and wholesome products while stimulating innovation. 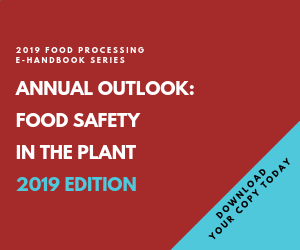 "These proposed changes to the food standards process will optimize use of new food processing and packaging technologies in the development of food products geared to the needs of today's consumer," says Robert Brackett, director of FDA's Center for Food Safety and Applied Nutrition. "Moreover, this is an excellent example of the type of collaboration between the nation's food safety agencies that ensures the American consumer safer, more diverse foods on the grocery shelves." Written comments should be submitted by August 19 to: FSIS Docket Clerk, Docket No. 95-051P, U.S. Dept. of Agriculture, Food Safety and Inspection Service, Room 102, Cotton Annex, 300 12th Street SW, Washington, D.C., 20250 or FDA Dockets Management Branch (HFA-305), Docket No. 1995N-0294, Food and Drug Administration, 5630 Fishers Lane, Room 1061, Rockville, Md., 20852.